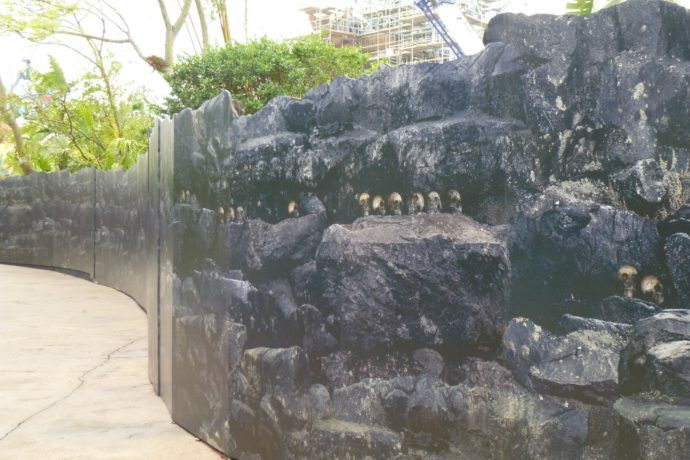 The walkway out in front of project 340, (AKA the new King Kong attraction at Islands of Adventure), has received some shiny new skull-themed construction walls. They jut out pretty far, but the area does look a little cleaner with them. It seems clear now with these skull themed walls what attraction they are in fact building back there, in case there were still any doubts. As far as construction progress goes, it looks like they’re putting a primer and/or sealant over the rockwork before painting, the top of the rockwork is looking more and more like the Skull Island temple, and the right side of the structure is finally getting all walled up. Check out the pictures below to see the construction progress as well as the new themed construction walls. And check out the previous update for some video! Also, be sure to check out the video and pictures of the screen-used cars from Fast and Furious 7, now on display at Universal Studios Florida.